Posted on August 6, 2017 by Marcia Dye. I can't fuss with taking a photo, transferring it, loading it here, but I have a few things from Foodstuffs. One thing that gets used frequently is a pizza paddle that now has a fine patina of age on it. Another purchase was a huge soufflé dish that I love but have never, ever used in the oven, only as a bowl. I don't make soufflés! Posted on July 16, 2017 by Marcia Dye. Great store. Great staff. Great products. Truly a one of a kind store - my favorite place to shop or just stop for a chat with the friendly staff and amazing owner, Marcia Dye. Great place to bring out of town guests. Congratulations on an amazing milestone. I have relied on Foodstuffs for the last 26 years. Thanks for being in Georgetown and the great products you bring in. I use the summary guide of how long to cook rice and grains often. Thank you for a great tool. I was enrolled in the Wilton Cake Decorating course, part 2, that was held above Foodstuffs. (I didn't even know that space existed). On the first day, we discussed our materials list and then we came downstairs to shop at Foodstuffs. Marsha stayed after the store closed and guided us through, advising what tools and ingredients we needed. I was so impressed with her eagerness, positivity and attention. The whole experience opened up a new section of the store that I had previously ignored. 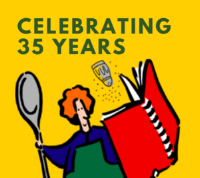 Congratulations on 35 years of success. Here's to another 35! Posted on June 30, 2017 by Marcia Dye. Village Festival... With a Pirate Theme !? Posted on June 26, 2017 by Marcia Dye.